It is true if you bury a Hawkman comic in the sand for a 1,000 years, it becomes priceless. This sort of blinked past the holiday weekend radar yesterday. I certainly hope you were outside, enjoying sunshine and barbeque, and this will be news. If not, I’m sorry…but some of our guys were flogging away on original pieces, so check those out! Yesterday, It’s On the Grid announced that a Hawkman movie was in development. Producers Adrian Askarieh, Gregory Noveck and Will Hacknerand are overseeing it for Warner Bros, and are in need of a few good screenwriters. 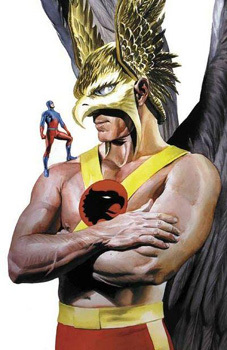 The idea that a Hawkman movie is in development isn’t too much of a surprise. Warner Bros wants to mine the DC stable as thoroughly as Marvel is mining theirs, and Hawkman is a dude, which makes him way more marketable than Wonder Woman. Part INDIANA JONES/DA VINCI CODE, part GHOST tentpole about the fictional superhero that appears in D.C. Comic books. He used archaic weaponry and large, artificial wings attached to a harness made of the Nth metal that allows flight. Most incarnations of Hawkman work closely with a partner/romantic interest named Hawkgirl or Hawkwoman in his fight against supervillains. Based on the DC comic. Because when you think Hawkman, you think Indiana Jones and his milquetoast imitators! Yes, Carter Hall was an archeologist who liberated items from a museum for his crime-fighting, but the similarity is slight. The emphasis has always been on his being the reincarnation of an ancient Egyptian prince…who was then retconned into an alien … who was then retconned into an Egyptian prince who was exposed to the alien Nth metal, forcing him into a constant cycle of reincarnation. But hey, completely snubbing a character’s real origin and abilities worked beautifully for Jonah Hex. Do that again! To be fair, this is still in early, early stages of development and it’s a logline designed to be punchy. And Indiana Jones has become a shorthand for archeologist, leading to permanent depression in those sturdy academics who spend their lives on pot shards.